The mayor would crack down on absentee owners who rent entire houses to tourists, but allow anyone to rent out a room in their home. Honolulu Mayor Kirk Caldwell wants to regulate short-term vacation rentals on Oahu in a way that will result in several thousand of those homes being taken off the tourist market, including several hundred properties on Oahu’s North Shore and Windward side, a Civil Beat analysis indicates. But since the measure also would for the first time allow several thousand short-term rentals in areas zoned for apartments, the net effect would be an addition of approximately 2,000 homes put back in the local market, data indicate. Caldwell hopes the proposal will ease the housing shortage on Oahu by hoping many of those vacation rentals operated by absentee owners would go back into the local housing market, either as long-term rentals or if the owner sells them. In some areas, such as Oahu’s Windward communities of Kailua, Lanikai, Kaneohe and Waimanalo, the net effects could be modest; as many as 760 rentals now operating could be shut down, but as many as 608 new ones could be allowed, resulting in a net increase of 152 homes for rent to locals. 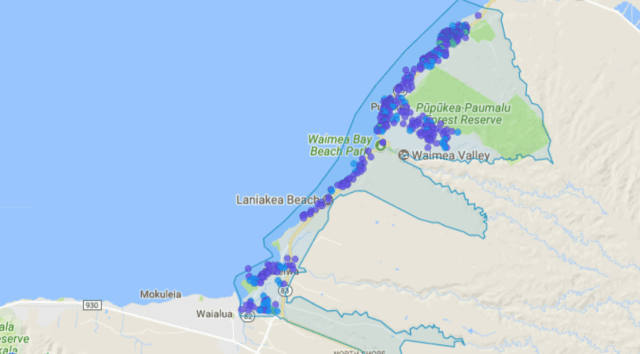 But a more profound impact could be felt in the North Shore communities of Haleiwa and Waialua and nearby Kahuku, Hauula and Laie, where as many as 1,173 rentals could be shut down and only 540 permitted, a net decrease of 633, the Civil Beat analysis of short-term rental data indicates. A proposed bill could result in many short-term rentals, including those listed through Airbnb, being placed back on the long-term rental market in North Shore areas like Laie, where this property is located. 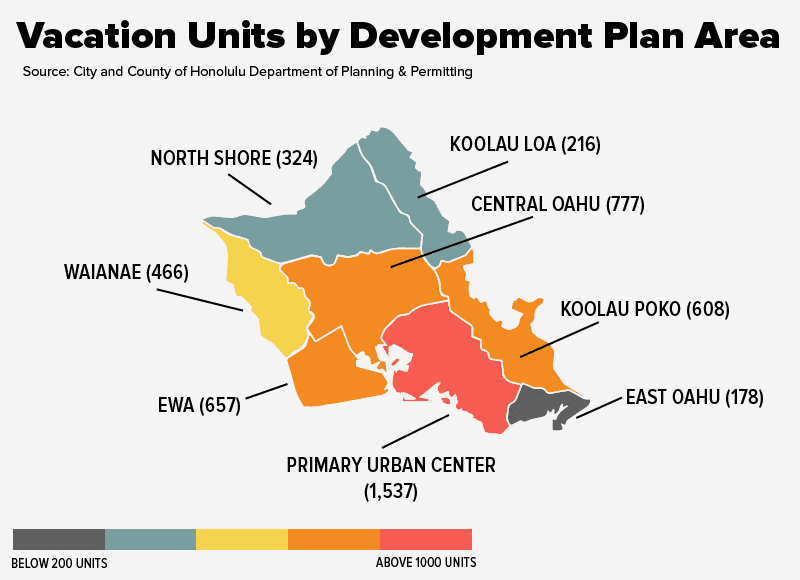 These numbers are estimates, based on data from Airdna, which analyzes markets served by Airbnb, and information from the Honolulu Department of Planning and Permitting. In addition, the estimates assume Honolulu Hale will be able to enforce the proposed law better than it has enforced the current, unwieldy land-use ordinance. Critics of the measure say it will be just as hard to enforce as the current law. 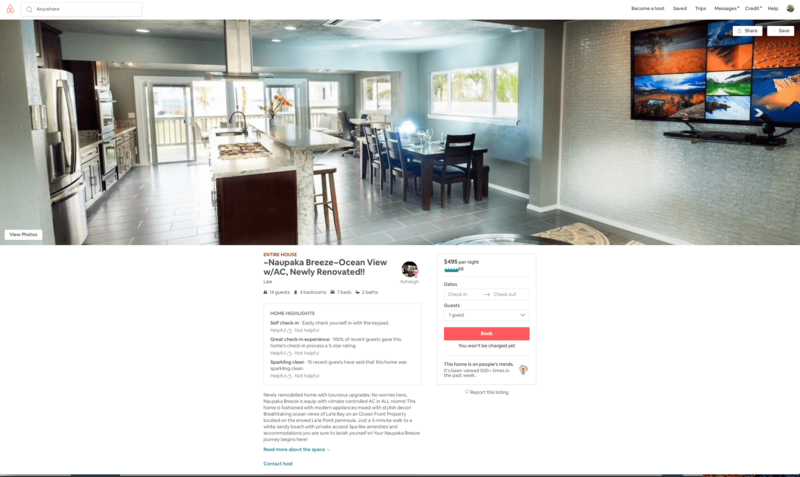 To identify the number of vacation rentals on Oahu, Civil Beat collected data from Airdna’s Market Minder tool, which provides market information on vacation rentals to real estate investors. This data, collected on August 14, included the number of entire-home rentals available per Oahu neighborhood. The proposed law generally prohibits entire-home rentals outside resort zones, but provides an exception that would permit more than 4,000 entire-home rentals, mostly condos, located outside of residential neighborhoods and dispersed around the island. To estimate the net effect of generally banning entire-home rentals but carving out an exception for more than 4,000 such properties, Civil Beat compared the Airdna data from selected neighborhoods with Honolulu Department of Planning and Permitting information showing the number of entire home rentals that would be allowed per Development Plan area. During an interview, Caldwell could not corroborate Civil Beat’s numbers. But he confirmed that one purpose of the bill is to bring more homes back onto the market for local residents, particularly in residential neighborhoods. “The entire North Shore will have no vacation rentals,” he said, but added that exceptions will be carved out for small areas zoned for apartments and mixed use. The bill would be a blow for Airbnb, whose site is replete with listings for North Shore vacation rentals. Matt Middlebrook, a public policy executive for Airbnb in San Francisco, declined to comment. Companies like Airbnb and Expedia, which owns the VRBO and Homeaway platforms, have been criticized around the country for inflating housing costs in big tourist destinations. Governments have fought back with tougher laws regulating the short-term rentals. Earlier this month, for instance, New York Mayor Bill de Blasio signed a bill that requires Airbnb to disclose names and addresses of hosts to let the city crack down on illegal listings. Tougher restrictions in San Francisco have resulted in thousands of listings being removed from Airbnb, according to the San Francisco Chronicle. In Hawaii, Maui voters in November will have the chance to approve a county charter amendment that would create a $20,000 penalty for operating illegal short-term rentals. Caldwell’s proposal has been praised by the hotel industry, but faces opposition from the hotel workers’ union and housing and neighborhood advocates. City Council Chairman Ernie Martin, whose district includes the North Shore, was not available for an interview. But he sent a statement saying his district has been inconvenienced by the proliferation of vacation rentals and that there’s merit in debating how many short-term rentals any one neighborhood should have. Actually, Caldwell’s proposal for the first time would legalize vacation rentals in residential neighborhoods, which are now generally prohibited. But such rentals would be allowed only in owner-occupied homes — the sort of home shares that Airbnb has previously cited to show how the company helps struggling folks make a few extra bucks. It’s a big change from Honolulu’s current land-use law, which is rigid in ensuring Oahu’s housing stock is used to house residents. The law generally allows short-term rentals only in places zoned for resort use, primarily certain parts of Waikiki. Although the law makes an exception for 816 properties grandfathered in under the law, most of those properties are located in a handful of high-rise buildings near Waikiki’s resort zone. 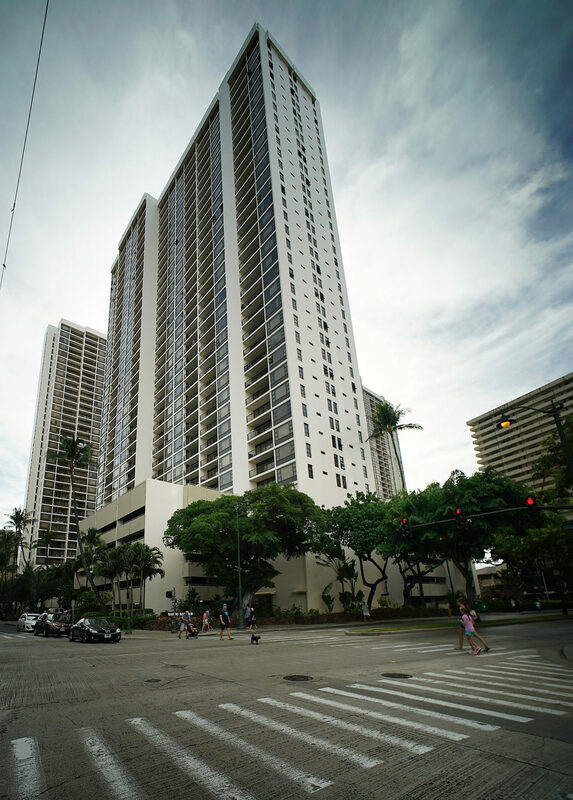 The majority of short-term rentals grandfathered in under Honolulu’s land use law are located in a handful of buildings in Waikiki, such as the Waikiki Banyan Condominium Hotel. Still, online sites like Airbnb, along with Oahu’s high hotel room rates and booming tourist market, have encouraged investors to buy homes outside the resort zones and rent them to visitors, in violation of the law. There were 8,522 active rentals on Oahu on Tuesday, according to Airdna; 6,842 of those, or 80 percent, were entire homes. Proponents of short-term rentals say they enable people to make ends meet by sharing rooms in their homes. But housing advocates say most short-term rental properties are entire homes, not just a room or two, and that renting out the properties for tourists means less housing for locals. Hotels face increasing competition for tourist dollars from properties rented through sites like Airbnb and VRBO. They say property owners running multiple whole home rentals are essentially hoteliers who pay lower property taxes. And for city officials, the sheer number of rentals has made it hard to enforce the existing law. Under the bill, which was unveiled last month, virtually any Oahu homeowner could legally rent up to two rooms of the homes that they’re living in, effectively converting the home into a bed-and-breakfast. But the proposed law carves out an exception for up to 4,781 vacation units, which would be allowed outside of resort zones. They would be spread out around the island, among various development plan areas, with none allowed in neighborhoods zoned for only single-family residences. But no more than 1 percent of residential housing per development plan area could be used for vacation rentals. Finally, any of the vacation units would have to be approved by condo associations. The practical result of these conditions would be that fewer than the 4,781 units allowed by the quota would actually go on line as rentals, said Kathy Sokugawa, Honolulu’s acting planning director. At the same time, operators of bed-and-breakfasts and vacation units would have to pay higher property taxes, impose house rules, hold insurance and offer amenities like off-street parking and smoke detectors. All of the rentals also would have to register with the city, which Caldwell has said will enable officials to easily track whether properties advertising online were authorized to rent short term. That’s a key to better enforcement. One purpose of these conditions is to prevent an excessive proliferation of bed-and-breakfasts, the mayor said. Another is to ensure a safe and pleasant experience for visitors, he said. Caldwell said the law would be easier to enforce than the current one because officials could simply track websites to ensure advertisers listed their registration numbers. And the measure would impose tough penalties for violations: $25,000 per day for first offenses, $50,000 per day for second offenses. And for third-time scofflaws who shrug off the law? “If they flip the finger at us, we fine them $100,000 a day,” Caldwell said. Will It Ease The Housing Shortage? Even factoring in the vacation units allowed by the proposed law, there would be a net increase in entire homes brought back into Oahu’s housing market for locals, based on the Airdna data. For example, in Koolau Poko, an area that includes Kaneohe, Kailua and Waimanalo, the law would allow up to 608 vacation units as long as they were located in areas zoned for apartments and mixed uses. But as of Tuesday, there were 760 entire homes for rent as vacation units in the area, according to Airdna. In theory, the bill would result in a net gain of some 152 homes put back into the rental market for locals. The numbers are even higher in Koolau Loa and the North Shore, where the combined net gain would amount to at least 633 whole homes, according to Airdna data. “I’m not saying we have the perfect model. We’re sort of plowing new ground here.” — Honolulu Mayor Kirk Caldwell. Choon James, a Laie real estate broker and former City Council candidate, cautioned that it’s flawed to assume all vacation homes taken off the short-term market would become long-term rentals. Many people couldn’t afford the going rate for a whole house in or around Laie, which she said starts at around $3,500 per month. And some absentee owners would let their houses remain vacant if they couldn’t rake in the $10,000 a month or more that they can get renting to tourists on Airbnb. Victor Geminiani, an affordable housing advocate with the Hawaii Appleseed Center for Law and Economic Justice, commended the mayor for creating a permitting process and limiting short-term vacation units. But he said the bill would still permit too many vacation rentals. And Geminiani strongly opposes unlimited bed-and-breakfasts. He said that unscrupulous investors will find ways to skirt the law and convert what are currently whole home tourist rentals into bed-and-breakfasts, and that will undermine any ability to enforce the law. “The profits are so enormous, you’ll never keep corruption out of it,” he said. Larry Bartley, a neighborhood advocate, went a step further. He said the city should simply enforce the current law, a sentiment echoed by Unite Here Local 5, a hotel workers’ union. “Until they say, ‘this is about enforcement,’ nothing will change,” he said. There were 558 active rentals in Haleiwa last week, according to Airdna. About 424, represented by purple dots, were whole-home rentals. The light blue dots show shared rooms. The bill is now before the planning commission, which will have a chance to weigh in before the measure goes to the City Council. Airbnb seems poised for a fight. The company has been vocal about past statewide efforts to regulate vacation rentals and helped stall those previous efforts. The company hasn’t been shy about trying to exert influence through its political action committee, the Committee to Expand the Middle Class. Since 2016, it’s given more than $40,000 to state and local elected officials, including significant sums to members of the Honolulu City Council: $4,000 to Carol Fukunaga; $3,500 to Kymberly Pine; $2,500 to Ikaika Anderson and Ann Kobayashi, and $500 to Martin and Trevor Ozawa. The committee also donated $500 to Caldwell. Meanwhile, Caldwell said the company has sent him mixed signals. Airbnb executives previously told him the site generally focuses on home shares instead of entire-home, “unhosted” vacation rentals, Caldwell said. But after Caldwell announced his proposed bill, he said Airbnb’s Middlebrook objected, saying “It’s going to kill unhosted” rentals. Middlebrook declined to comment on Caldwell’s account of their talks. In any case, Caldwell said, the bill is just that — a proposal that Airbnb and others can weigh in on. 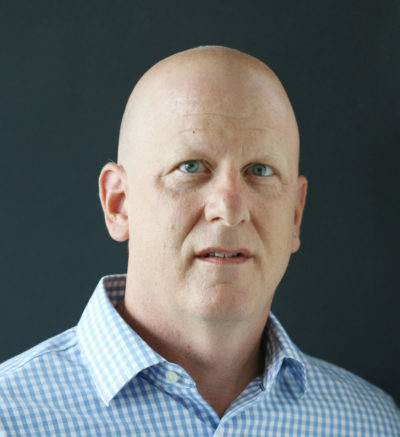 Stewart Yerton is the senior business writer for Honolulu Civil Beat. You can reach him at syerton@civilbeat.org.